One of the strange paradoxes of life is society’s simultaneous insistence that you should “accept yourself for who you are" and also that you should constantly try to improve. But living with this ambiguous juxtaposition also requires letting the world tell you what parts of yourself you are and are not “allowed” to stress or complain about. For example, if you are naturally intelligent and are academically successful, then of course you have no right to worry about a major test or assignment. Worrying is not for straight-A students. Everyone knows you will do well (but God forbid you fail to meet those expectations). 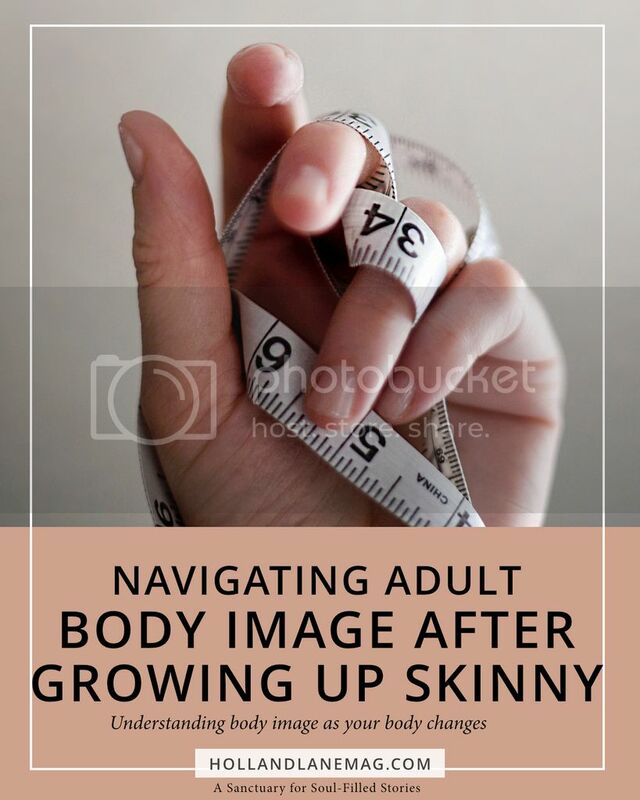 Growing up, I was what you would call “skinny.” In fact, I was what you would call “really skinny.” Between a rapid metabolism and a naturally boyish figure with no real curves to speak of, I had pretty substantial difficulty gaining weight. I was the only girl in my circle of friends who wore size zero jeans for any length of time, and had to wait quite a while before I finally reached triple digits on my bathroom scale. It did not take me long to learn that people will not allow you to voice negative or concerned comments about a part of yourself unless they also perceive it as a problem. Since being skinny was a universal goal, it did not matter what I did or did not like about my body. Any mention of uncertainty about my body shape was immediately dismissed with some comment along the lines of, “Stop, you’re so skinny!” Girls with more curves and body fat (and not even necessarily in a bad way) were given more air time to voice their own insecurities about their bodies, as if one’s allotted insecurities were proportional to one’s body fat percentage. So I focused instead on being self-conscious about my skin and other areas of which my complaints were deemed more deserving. It has become increasingly clear to me that people naturally assume that genetically slender individuals do not have problems with body image (or that, if they do, they are only imaginary). I, however, believe that that preconception is false. Because I grew up not having to worry about my weight, I never had the need or desire to learn what a healthy weight was and how to achieve it. As I’ve grown older and become an adult, I still have a slender body type, but my metabolism is not what it used to be. I did not develop a “womanly figure” until around age 22, and by then I had become so comfortable that I viewed any new body fat in the same way that a small town views the sudden arrival of an outsider: combined fear and dislike – I don’t know you, I don’t know where you came from, please go away. I had no knowledge about what weight gain was healthy and what was not, and was forced to draw the conclusion that I was getting fat. Since then I have been in what feels like a self-taught remedial health course and have learned about something called “skinny fat” (which is apparently the term for problem areas on an otherwise slender body type). I am playing catch up in terms of exercise and eating healthy, but I am also playing catch up in terms of how I view myself and my body. I have learned that there is nothing wrong with wanting to improve yourself, but it should not be at odds with accepting who you are. Attempts to improve yourself cannot stem from discontent, because you will never reach an all-around satisfactory end result. There will always be some part of you that is not ideal, but there is an imperfect beauty in that. Most importantly, I have learned the importance of listening and respect. Whether or not you think a friend’s concerns are legitimate, it’s crucial to respect them because they are coming from a person you care about. Respecting the information that a person chooses to share with you is respecting that person, and a little of that goes a long way. When my early concerns were dismissed, I learned to keep them to myself, and that only resulted in confusion on my part. While it is true that we see ourselves differently than others see us, and that what we think of as problems may to others seem like nothing worth worrying about, we must encourage rather than dismiss each other. In my opinion, genuine encouragement is highly undervalued, but essential to healthy relationships (with ourselves and with others). The things said by those closest to us have an immeasurable impact on how we see ourselves and how we see the world, and a kind word is always beneficial. When I looked in the mirror, all I saw were lines and shapes that I did not want. But I did not need someone to teach me how to remove them; I just needed someone to show me how they were part of an inimitable whole. Valerie Vondra is a graduate of Grand Canyon University, where she studied English Literature. She resides in Phoenix, Arizona, is constantly learning new ways to escape the perennial heat, and right now is probably dreaming of her future life as a cat mom.